Pastry chef or chocolatier? Yusuke Aoki is both, and a world champion at that. Crowned World #1 the 2018 Valrhona Chocolate Chef Competition (C3) in New York City, as well as Best Pastry Chef at the 2018 Indonesian Salon Culinaire, Yusuke’s career started at a French pastry boutique in his native Japan. He moved to Paris to hone his skills in pastries, wedding cakes, banquet and restaurant desserts, chocolate pralines, showpieces and sugar decorations, before transferring to an international hotel in the Middle East. Since moving to Indonesia in 2017 as Executive Pastry Chef of Four Seasons Resort Bali at Jimbaran Bay, Yusuke has launched a custom-designed, temperature-controlled patisserie at Taman Wantilan restaurant, offering diners an unlimited selection of dainty French desserts that pop with Balinese flavours. Highlights include cinnamon, cloves and poached pear baked tart, and mango mousse cake with coconut sponge. 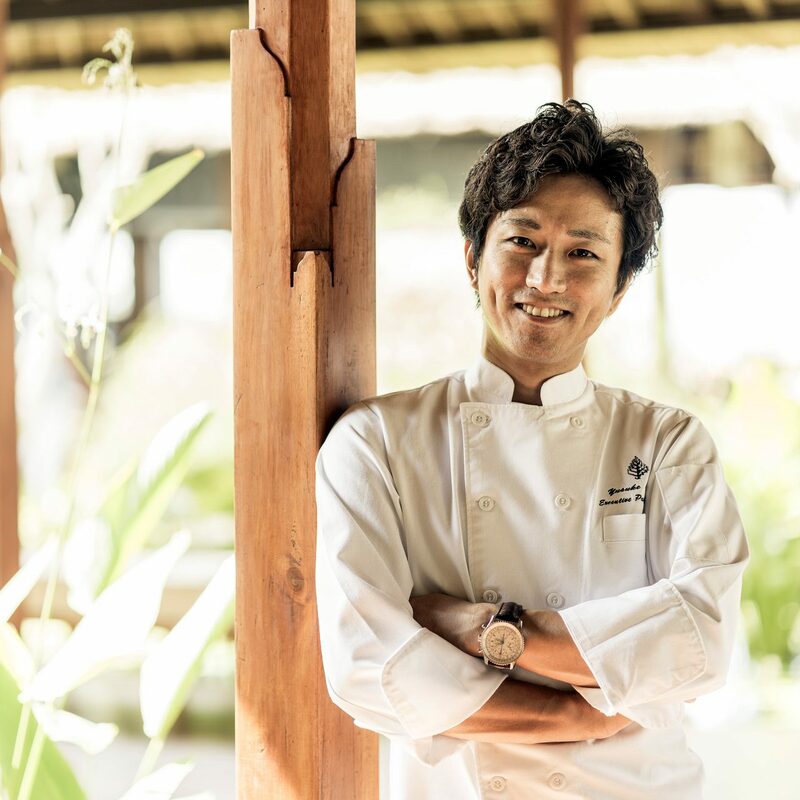 Overseeing 25 chefs, Yusuke is also responsible for the world-class desserts at Sundara beach-club and restaurant, Pool Terrace Café, Jala Balinese restaurant, in-villa dining, weddings and banquets. Yusuke roasts and grinds the cacao beans using a melanger on-site in his pastry kitchen at the Resort. Taking more than 16 hours each batch, it is a labour of love. The result is 65 percent organic Bali chocolate with a smooth, silky texture and notes of banana and passion fruit, exclusively available at Four Seasons Resort Bali at Jimbaran Bay.